This tutorial will guide you through the steps to converting an existing video file to a .wmv (Windows Media Video) to play on your Windows Mobile device. First things first – download Windows Media Encoder from Microsoft. It’s free. It works in 2k/XP and though not ‘officially’, it seems to work fine in Vista. The installation is painfully straight forward – you’ll just click ‘Next’ a bunch of times. Once the installation has completed, launch Windows Media Encoder. Select Convert a file and then click OK.
From the Source file: section, click the Browse button. Navigate to the file you want to convert into a wmv, select it, and click OK. The first time you convert a file you may want to go with a smaller one. It will take less time to encode, and if the resulting quality isn’t good enough, you won’t have ‘wasted’ a lot of time. Once you find the settings that work best for playback on your device, you can convert larger/longer videos with confidence. The default Output file: name and location will be identical to the input file, but with .wmv as the extension. You can change the name and save location of the output file if you wish, by clicking Browse. Once you’re happy with the input and output files, click Next. You’ll be prompted to select a Content Distribution method. For the sake of converting your first video file, select Pocket PC as the method. Further down in this tutorial (step 12) I’ll go into more detail on customizing the quality of .wmv. Click Next. Review the info on the Encoding Options. You may even want to write it down, so you can compare it to customized video files that you’ll be trying out later. Click Next (not Finish). Enter the meta data for your video. This isn’t mandatory, but it does help when you’re searching for files, how they’re displayed in Windows Media Player etc. When you’re done, click Next. And now review all of the info for your video conversion. Remove the check from the Begin converting when I click Finish (so that you can preview the encoder window before it’s actually encoding). Click Finish. And here it is. The main encoding window. You can click around and explore the various options, but try not to change anything quite yet. You’ll want to create a default Pocket PC video, so that you can compare its quality to the custom videos you’ll create later. Click the Start Encoding button when you’re ready to convert the video. Make yourself comfortable. Or, make yourself a cup of coffee. Watching videos encode is about as interesting as watching paint dry. By default, the video will go through two ‘passes’. Once the conversion has finished, you’ll be presented with a summary screen. Here you can find the resulting file size, bit rates etc. Click Close. Navigate to the output file, and upload it to your Windows Mobile device (via ActiveSync or Windows Mobile Device Center in Vista). Give the video a play. Watch it in full-screen and try to determine if the audio and video quality are suitable for you. At this point, if you’re happy with the resulting file – you’re done. If the quality is good enough for you, you can just repeat the above steps to convert more of your video files. Remember – the resulting file is never going to be better than the original file, but a lot of the time it will be smaller in size, and of decent enough quality to suit a small screen device (as most Windows Mobile products are). If you’d like to try customizing the videos to go for higher audio, video (or both) quality – keep reading. Using the same file that you converted in steps 1-14 (so you can compare the resulting quality), repeat the same steps (but choose a different name for the resulting file, otherwise you’ll over-write the first .wmv). This time when you get to step 7, again be sure to remove the check from the box labeled Begin converting when I click Finish. Click the Properties button and then select the Compression tab. From here, you can increase the quality of the video by selecting a higher bit rate. You can also increase (or decrease) the Audio bit rate. Click the Start Encoding button when you’re ready to convert your video again. And once again watch as it converts/encodes. Click Close after reviewing the results. Transfer the new video to your Windows Mobile device and compare the quality to the first video. Depending on what type of Windows Mobile device you have, the higher the quality, the harder it is for the device to play back the file. So files that are encoded at a very “high” quality, actually suffer by jittery playback on your Windows Mobile device. The trick is finding the right bit rate and quality settings that are best for your device. Prefer to use powerful prog like MelodyCan (http://www.convert-any-media.com/index.php). It converts different audio & video file formats. Such as wma, wmv, m4v, mov, aac, ra, aa, mp4, snd, aif, m4p, rax, wav, ogg etc. Moreover MelodyCan converts audio books, any format Media Player, any format QuickTime Player, any format Rhapsody or RealPlayer supports. It`s very simple to use. Moreover MelodyCan converts audio books, any format Media Player, any format QuickTime Player, any format Rhapsody or RealPlayer supports. Now I can download YouTube files to your PC with MelodyCan YouTubeRipper. Conversion speed and quality is very good. Also I noticed when playback window is partially obscured it doesn’t affect converted file. So as for me MelodyCan is a great solution to convert protected files – legally. I have a sneaking suspicion you are somehow, directly or indirectly, being paid to make that comment, but I’ll leave it up anyway. You might want to mention that MelodyCan isn’t free, and it doesn’t “legally” convert copy-protected files, there’s no such thing. It’s either legal to do in your country or it’s not. The software you use doesn’t make it legal. I’ll take the free program. Thanks Ross. Hum. I have a slight problem that I get no sound. This has really helped me as I have an old iPaq I want to conver to use to watch movies when I travel from an SD card. I’ve tried everything to get a coverter that get my files to work with pocet pc media player 8, and this is brilliant, but the audio option is only for media player 9. D’oh. Any suggestions? managed to sort it! jsut had to choose the voice option on the audio! Thank you very much for this post. I trying to convert some flash videos to my windows mobile device. When you say you just had to choose the ‘voice’ option on the audio, where is the ‘audio’ you reference? I’m having the same trouble with my ipaq rx3115. It won’t play audio on .wmv files. I can’t find any voice setting on the ipaq. I’m also trying to convert movies to watch from an SD card on an iPaq when I travel. I followed your very helpful instructions but the resulting wmv file is only 6+ minutes long – a small part of the 80+ minute movie. What am I doing wrong? Thanks – any help is greatly appreciated. 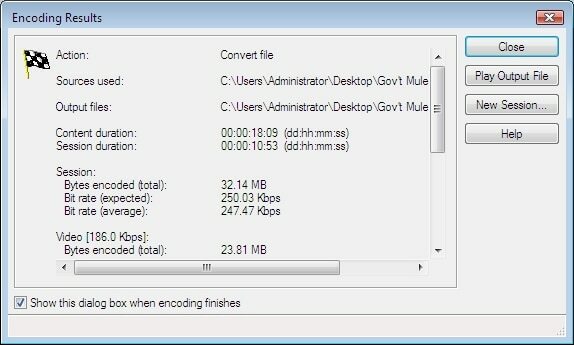 How to convert Windows flash plyer file to media player. Can you view/play the original file ok? no, but the reason i cant is because it’s in some weird format that my computer doesnt read. thts why im trying to convert it. Any advise as I’m following this process step-by-step. This is great help to me… I’ve been having no end of trouble moving stuff from my PC to my WM5 device. I’m going to try this when I’m back home! Copyright law does change from country to country, but I guess if you move from one country where downloading and sharing isn’t a problem unless you sell the content [like spain at present] then go to the US with the same content in a device this is where it gets a bit sticky I’d imagine. Still, when mashing up copyright free videos [Day of the Dead] and those that have fallen out of copyright… http://www.moviesfoundonline.com/ for personal use [like making a documentary or music video [in my case]] then your help for this article is just COOL! Hi There, i hope you can help me. I have real player where i can down load videos from the net. I now need to convert them to Windows media player, i downloaded the encoder but it either gives me an error or it doesnt support the real player file. What should i do?? I am not the biggest boffen when it comes to IT stuff. Please help! Thank you. This was of great help to me and worked absolutely fine. Hello everybody. I don’t know why but everytime I get to step 8 I get a box saying: ” Windows media encoder has encountered an error and must close now” , why do I get this?? Can someone help me please? I want to convert mbv files to wma in order to edit it in windows movie maker….. It was going smooth and I encountered this error message—input media format is invalid, (0x00d0bb8) What di I need to do differently? This is fantastic software. It has made my life little easier. How can you change audio (a song) to a windows media file? I want to make a video with a song in Windows Movie Maker, but I need a song in the file of Windows Media Player or something. Please Help, I need the video done ! How to convert video to Window Media Player? Thank you for these instructions, really helpful!! But there is a little problem when converting a video to wmv it doesn’t keep the audio. Any thoughts on what else I could check to fix this. I used to convert video with Acethinker Video Converter, never had that problem.